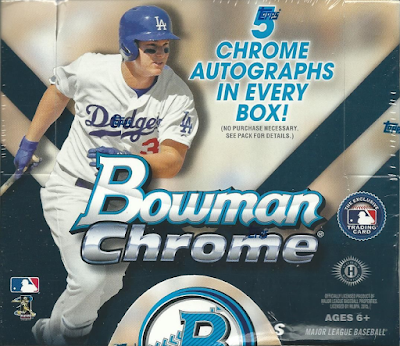 I'm not quite done writing about Topps newest release - 2015 Bowman Chrome Baseball. 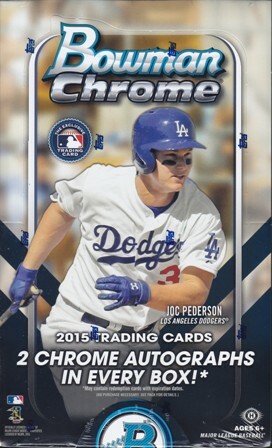 I had failed to previously mention that Dodger rookie Joc Pederson is on every box of cards. As you know, the Bowman brand is geared primarily towards prospects and up-'n-coming ballplayers, so it's no surprise they would reach out to the All-Star Game Home Run Derby runner-up to promote the product. Unfortunately, his early promise failed to materialize into a consistent season worthy of "Rookie of the Year" consideration. Still, he was clearly one of the best rookies half way through the season. Next year I wouldn't be surprised if Corey Seager received the same treatment from Topps. Check out pics of both the normal wax box (above) and the jumbo box (below) featuring Joc Pederson. Go here to check out all of my previous post on this set.